Medical Cannabis Outreach helps people of all walks of life gain access to natural treatment in the form of medicinal marijuana and CBD oil. With six convenient locations across the state, we are recognized as one of the best medical cannabis clinics to visit if you want to learn more about alternative treatments or apply for a medical card in Illinois. We do everything from medical card consultations, evaluations, and approvals to mobile wellness clinics, educational seminars, and so much more. Lots of patients have chosen us as their go-to for information about the medical card process, as well as the benefits of medical marijuana and CBD oil for a number of ailments. Our in-clinic physicians and staff members are passionate about helping others find relief with medical cannabis, and we invite you to use us as a resource on your journey to wellness. That being said, here are some of the most frequently asked questions about medical marijuana cards in Illinois. Is Medical Marijuana Legal In Illinois? Yes. Illinois legalized medical marijuana back in 2013 with the introduction of the Compassionate Use of Medical Cannabis Pilot Program Act, making it one of the 33 U.S. states that have legalized it for medicinal use among patients with qualifying health conditions. To legally obtain medical marijuana in Illinois, you must be at least 18 years old and have a severe or debilitating health condition that qualifies you for treatment. What Health Conditions Qualify Me For A Medical Card? Given that recreational marijuana is not yet legal in Illinois, there are strict rules about who can get a medical card. Most health conditions that qualify patients for this treatment are severe and/or chronic, meaning that they have a significant debilitating effect on the patient’s daily life. Examples of qualifying conditions include cancer, amyotrophic lateral sclerosis (ALS), multiple sclerosis (MS), rheumatoid arthritis (RA), and complex regional pain syndrome (CRPD). Check out our complete list here, and feel free to contact us with more specific questions if you are wondering about a health condition that is not listed. Can I Get A Medical Card As A Caregiver/Parent? Yes. Certified caregivers and parents of children with severe health conditions may register for a medical marijuana license in order to obtain treatment for the patient or child. This allows the caregiver or parent to visit medical marijuana dispensaries on their behalf so they don’t have to leave the house, which is impossible for some patients (esp. those in hospice care or who have immobilizing disabilities). It is important to note that these caregivers and/or parents are not permitted to consume the treatment themselves or distribute it to anyone other than the registered patient. Are There Military Discounts For Medical Cards? Yes. U.S. veterans with DD214/discharge papers who have a qualifying health condition are eligible to receive a 50-percent discount on medical marijuana cards. This includes veterans with PTSD, brain injuries, spinal cord injuries, nerve damage, and many other unfortunate consequences of combat. Disabled patients who are on Social Security Disability Insurance also qualify for this discount on medical cannabis cards. How Much Do Medical Cards Cost? Medical cards are available in one-year, two-year, and three-year registration terms for patients who qualify. A one-year medical card registration costs $100, a two-year registration costs $200, and a three-year registration costs $250. For veterans and patients on SSDI, this translates into $50, $100, and $125, respectively. This is a mandated state fee, which covers the cost of paperwork processing, medical card creation and mailing, state taxes, and other aspects of the application process. What Is Involved In The Medical Card Process? There are several steps to getting a medical card here in Illinois. First, you’ll need to get evaluated and approved by a certified physician, who will determine whether or not you have a qualifying health condition. Assuming you are approved, you will have your photo taken for the ID, pay the mandated state fee, and submit your medical card application. Within 90 days of your submission, the state will approve you for treatment and send you an official medical card. Can I Get Medical Marijuana And CBD Oil With A Medical Card? Yes. Both medical marijuana (THC) and CBD are available for medical card holders to purchase. The benefits of CBD oil and medical marijuana vary from person to person, as some prefer one form of treatment over the other (THC produces a “high,” while CBD does not have a psychoactive effect). If you have a medical marijuana license and are curious about whether THC, CBD, or a combination is best for you, feel free to consult our in-clinic physicians for more information. 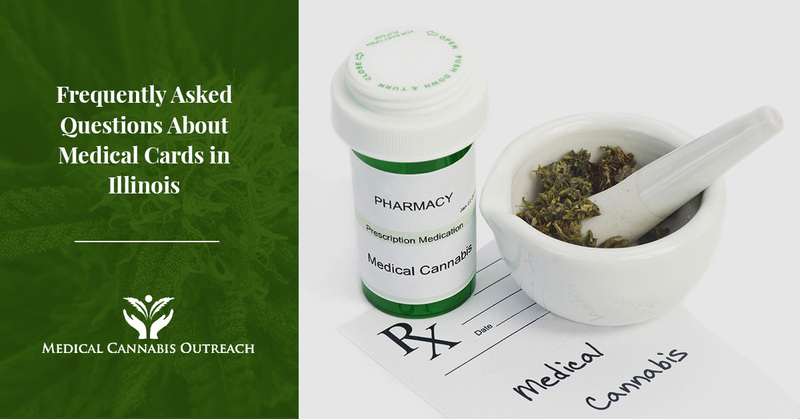 We hope that this blog post has answered some of your questions about getting a medical card in Illinois and that you will choose Medical Cannabis Outreach as your preferred cannabis clinic. Click here to find a medical cannabis clinic near you, or visit us today in Chicago, Savoy, Pekin, Wood River, Harrisburg, or Shelbyville!